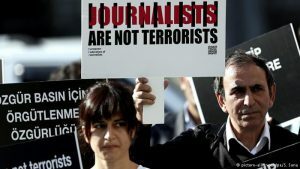 17 Turkish journalists run into in trouble – Royal Times of Nigeria. 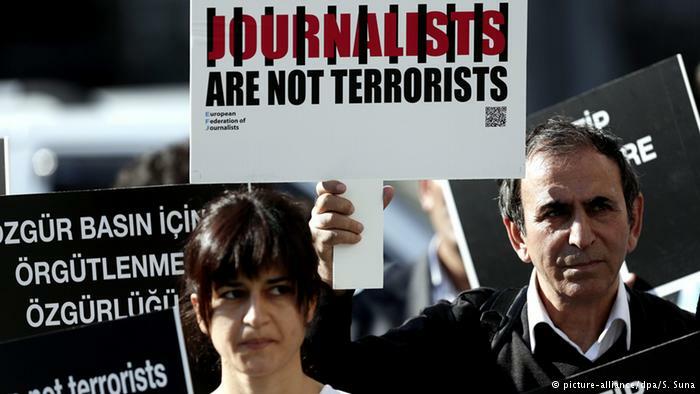 (Reuters) Seventeen employees of a Turkish opposition newspaper went on trial on Monday accused of supporting a terrorist group, a case seen by government critics as a further sign that freedom of expression is under attack. “Journalism is not a crime,” chanted several hundred people gathered outside the central Istanbul court to protest against the prosecution of writers, executives and lawyers of the staunchly secularist Cumhuriyet newspaper. The hearing coincides with an escalating dispute with Germany over the arrest in Turkey of 10 rights activists, including one German, as part of a crackdown since 2016’s attempted coup against President Tayyip Erdogan. Turkish prosecutors were seeking up to 43 years in jail for staff from the paper, including some of Turkey’s best-known journalists, who are accused of targeting Erdogan through “asymmetric war methods”. “According to the government, everyone in opposition is a terrorist, the only non-terrorists are themselves,’’ Filiz Kerestecioglu, a member of parliament from the pro-Kurdish opposition party, told newsmen ahead of the trial. According to the 324-page indictment, Cumhuriyet was effectively taken over by the network of U.S.-based cleric Fethullah Gulen, blamed for the failed putsch last July, and used to “veil the actions of terrorist groups”. However, Gulen has denied any involvement in the coup. The newspaper has called the charges “imaginary accusations and slander”. Social media posts comprised the bulk of evidence in the indictment, along with allegations that staff had been in contact with users of Bylock, an encrypted messaging app the government says was used by Gulen’s followers. Rights groups and Turkey’s Western allies have complained of deteriorating human rights under Erdogan. In the crackdown since July 2016’s failed coup, 50,000 people have been jailed pending trial and some 150,000 detained or dismissed from their jobs. According to the Turkish Journalists’ Association, as part of the purge some 150 media outlets have been shut down and around 160 journalists are in jail. The crackdown has strained Turkey’s ties with the European Union, but reaction from the bloc has been restrained because it depends on Turkey to curb the flow of migrants and refugees into Europe. However Europe’s leading power, Germany, has stepped up pressure in recent days, threatening measures that could hinder German investment in Turkey and reviewing Turkish applications for arms deals. Turkish authorities say the crackdown is justified by the gravity of the coup attempt, in which rogue soldiers tried to overthrow the government and Erdogan, killing 250 people, most of them civilians. Cumhuriyet is accused of writing stories that serve “separatist manipulation”. The newspaper’s editor Murat Sabuncu and other senior staff have been in pre-trial detention since being arrested in November. Other defendants include well-known columnist Kadri Gursel and Ahmet Sik, who once wrote a book critical of Gulen’s movement. Former editor Can Dundar, who is living in Germany, is being tried in absentia.